When planning an event, clients will often have an array of short-listed venues. Most of them will be safe choices, with one draw or another over the others. And then there is the wild card: A venue that is completely different. Here at Merlin Events we know this kind of venue all too well, having such different unique venues in our portfolio. As you can imagine, therefore, we are quite the supporters of this choice! The Merlin attractions are well-loved and respected venues which many clients use as their ‘wild cards’ when presenting their final pick to the event decision makers. But when pitched against hotels and ‘safe’ choices, what gives these unique venues their edge, and what it the main allure of the curve ball venue? 1. Set yourself aside from stereotypes. First and foremost is the fact that unlike a lot of hotels and venues in London, these places are well known for very different reasons. You won’t be therefore automatically lining yourself up for comparisons with other events. Childhood memories spark fond appeal towards these venues, and nostalgia is a very strong emotion which can drum up excitement of its own. 2. Entertainment is part of the experience. At Madame Tussuads your guests will have been on a ride, seen the workings of a wax figure, and taken selfies with their favourite celebrity, all within the space of the first ten minutes of being in the venue. As soon as guests walk through the door of a unique venue such as this one, they are taken on a journey which cannot be recreated anywhere else. With an actor-led tour at the London Dungeon, divers playing amongst the sharks at the SEA LIFE London Aquarium, and a 4D show in the Marvel Stardome, there really isn’t any need to worry about your guests being bored. 3. Let the theming work for you. Why stop at the theming already there? If you have been struggling for an idea to trump last year’s James Bond theme party, use the backdrop of a fully themed venue to work for you, and incorporate this in an exciting way. An I Love London theme works wonders at Madame Tussauds for example, and you can bring this to life even more so with lookalikes or tribute bands. 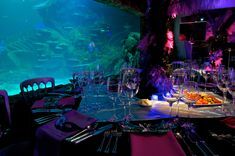 Create an underwater theme to bring out what the SEA LIFE London Aquarium already has to offer. And the London Dungeons… well use your imagination! 4. Social Media presence. With a venue so photogenic it is almost certain that our guests will be snap-happy. For most companies this is a massive plus point as it means free publicity! Plus it is always great to show that your company looks after its employees by throwing fun events! 5. Exceed expectations. Isn’t it exciting to have an upcoming event that your employees can’t wait for and just don’t know what to expect? The likelihood is that the turnout will be higher as guests won’t want to miss out on something new and fun. They wouldn’t be as worried about skipping a hotel reception in place of the pub. 6. Look after the none-drinkers. An increasing amount of people are turning their back on alcohol. Couple that with pregnancies and cultural reasons and you are always left with a percentage of guests who won’t be drinking. A venue which doesn’t offer much else other than food and drink can therefore lose its appeal for the teetotal guests. Ensure they have lots to keep them entertained by choosing a venue where alcohol isn’t the number one priority. 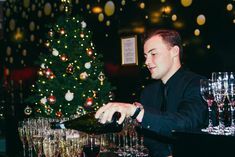 So if you have been given the task of arranging your company’s party this year, don’t be afraid of taking a risk and go for something that is outside the norm and go with the wild card. We promise you it will be worth it!